ST. JOHN'S, NL--(Marketwired - Mar 2, 2015) - First impressions, it's been said, are the most important, and on that score the newly remodeled Courtyard St. John's Newfoundland is at a distinct advantage. 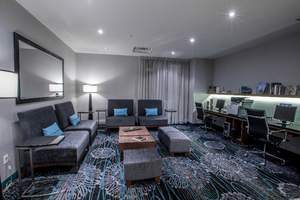 Following a $2-million overhaul of its guest rooms and public spaces, the boutique hotel boasts both beauty and high-tech brains, thereby ensuring guests won't find a more exciting or accommodating stay anywhere else in St. John's, Newfoundland. The experience begins in the lobby, where the efforts of Moureaux Hauspy Design, Inc. have resulted in a cool, modern space that is as flexible as it is functional. Unique among other hotels in downtown St. John's, the lobby offers Wi-Fi access and a variety of seating zones to accommodate travellers who wish to relax alone, gather with friends or conduct impromptu meetings. No matter how guests spend their time, the award-winning design firm has ensured they do so in style. Rich woods punctuate the light, airy space, which is draped in dove grey, charcoal, glass and textural fabrics. The delicately integrated nautical theme that swims throughout the lobby appears again in the hotel's new restaurant, aptly dubbed Fish Bowl. As the newest and perhaps most exciting of St. John's harbour-view restaurants in Newfoundland, Fish Bowl serves local seafood specialties prepared with both passion and innovation. Guests can taste the excitement themselves anytime they drop in for breakfast, lunch or dinner. In addition to the public spaces and the revamped meeting rooms (which now sport contemporary furniture and state-of-the-art audiovisual equipment), the 86 guest rooms have also been updated. Visitors can look forward to a good night's sleep on plush new bedding, while those visiting for business benefit from the functional workspaces and free high-speed Wi-Fi. Separate seating areas and spacious bathrooms also work to create a space where guests can stay connected, productive and refreshed. Between the lobby and the guest rooms, the restaurant and the meeting space, this boutique hotel proves that positive first impressions are good, but exceeding them is even better. 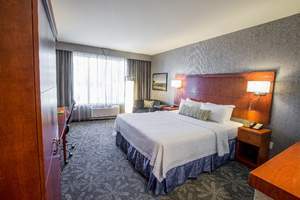 Located in the heart of downtown St. John's, the Courtyard St. John's Newfoundland welcomes guests with newly remodeled accommodations, award-winning service and a host of amenities. Business travellers can get to work in the hotel's 1,722 square feet of function space, or stay productive in the full-service business centre. Guest rooms help visitors stay on track, too, with features like free high-speed Wi-Fi, large desks and ergonomic chairs, but those travelling for pleasure will appreciate the plush bedding, flat-screen televisions, On Command movies and in-room fridges as well. Offering one of the most exciting restaurants in St. John's, Newfoundland, the hotel takes its culinary cues from the sea in its Fish Bowl dining venue. Other features, like complimentary valet parking, laundry facilities and a fitness centre, make everyone feel at home, even as they explore nearby attractions like George Street and Signal Hill. Following a $2-million overhaul of its guest rooms and public spaces, the boutique hotel boasts both beauty and high-tech brains, thereby ensuring guests won’t find a more exciting or accommodating stay anywhere else in St. John’s, Newfoundland. In addition to the public spaces and the revamped meeting rooms (which now sport contemporary furniture and state-of-the-art audiovisual equipment), the 86 guest rooms have also been updated. Visit our photo gallery to see the results of our renovation!